Now that does look smart! The big advantage of this livery is that its basically all over red so the paint shop is really turning them out now. Repaints have been very few over the last few years so there is some catching up to do. Although I like a bit of variety there are too many variations of Citybus livery out there at the moment. Looks lovely! Though I definitely agree there are too many variations of livery out there at the moment, the red only skirt, red front, the Ray Stenning livery, the new swoops livery, and the August 2012 plain red. 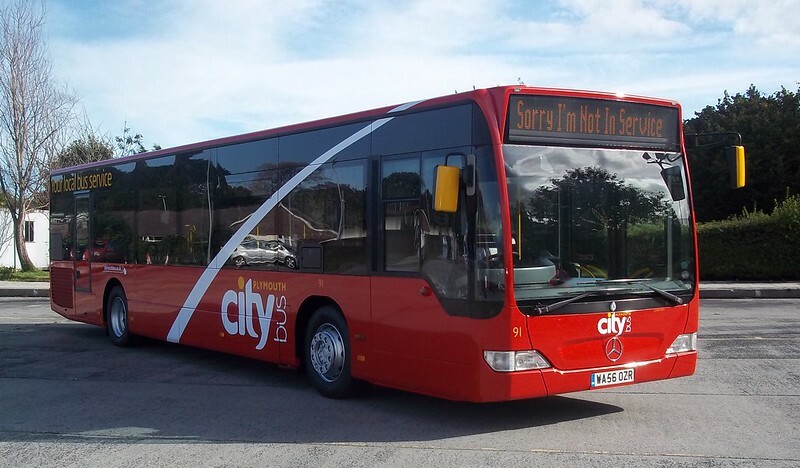 What with the upcoming service change, Citybus are obviously keen to attract more customers, so a consistent livery would really help people recognise and become familiar with the Citybus 'brand'. Going back to the old "Red Buses" of Citybus, with a modern "swoosh". Very smart. It would look better without the 'your local bus service' text in yellow. How come 4 are the new B7's haven't been out this week but sat in the depot? Have they been removed from the 43A? The B7s are awaiting some warranty work. Tey will be back out soon. wots wrong with the yellow writing? Its promoting the fact its your local bus company. the fleet in the past has looked unkempt especially the 08 plate enviro with bad skirt damage. 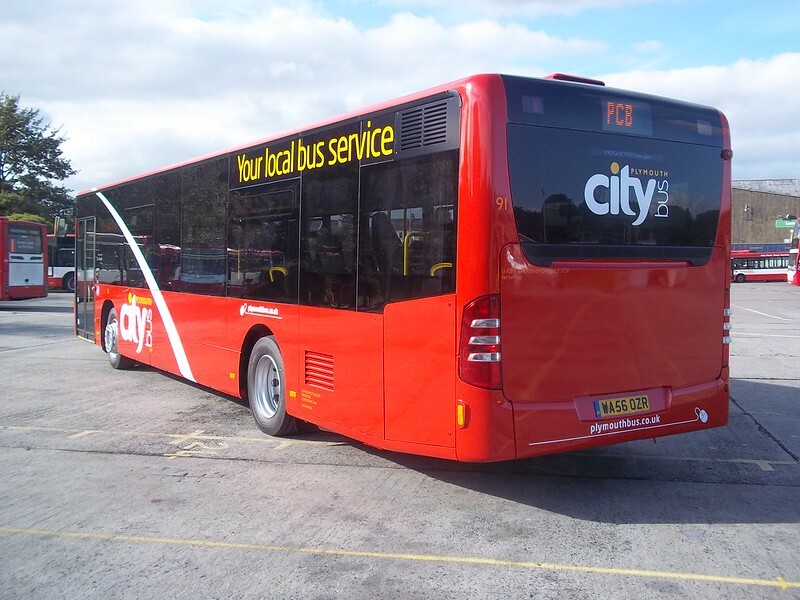 Citybus have now found a fresh livery which stands out even on a dull day. It takes a week or more to actually prep and spray a bus and it is not cheap either. And the company has to have a certain amount of buses ready for service too. Things take time and do not happen overnight. Citybus are doing their level best to get the fleet back to the standard of the 'old days' if u like, where the buses were smartly turned out. All it need is for the drivers to take care near high kerbs to keep the skirts free of damage and the passengers to not chuck their rubbish on the floor and put it in the bin provided or take it with them. If we all do ur bit then they will stay looking good. Imagine if the swoop went the other way. It would actually lead into the 'Your local bus service'. We all know why that slogan is important just at the moment. I have consistently held the view that the swoop goes the wrong way, since we were first treated to a view of the new style. It just looks wrong reaching forwards, when it could flow backwards onto the slogan. And please, keep it off the glass! Go on, Brian. 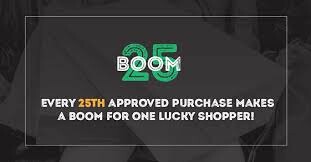 Give it a try on a sample vehicle. The livery is now set and will remain as is for the foreseeable future. A bit like Marmite I suppose, love it or hate it. We will not cover windows (bar the rear window) with the awful contravision that passengers hate however the swoop doesn't look right if it does not continue across the windows. Nice to read all the different comments about the livery since it came out, for against and neutral however as stated before cost is also a major consideration. We don't want to have to pass on the costs of fancy paint jobs to our customers. In my opinion the revised red does look excellent and as others have commented makes the new livery look so much brighter on dull days. The white “swoop” continuing over the window glass as it presently does just looks so wrong (to some other people and to me). It also looks strange from inside the bus to have two (semi translucent during the day) white tapering bars going across the glass. I realise that Plymouth Citybus is at liberty to do whatever they want with their livery schemes. I just ask that why when the Ray Stenning “swoops” looked so much better as they were kept on the body panels, could the revised “swoop” design not also have followed in a similar way? hear hear brian. maybe we should call it the 'marmite' livery?! A question for George if I may - I noticed that in the changes, "most" journeys of the 45 would lead off the 43A. Is this currently happening at the moment? So I could get on a Saltash and continue through to Ivybridge on the exact same bus? If this is the case, won't this cause delays to both services? Tailbacks on the A38 for example... Thanks! The new service 45 is not linked with the Saltash services at the moment. This is not proposed to happen until 11 November 2012.